The actions of President Trump and his White House press secretary Sean Spicer over the weekend—lying about the size of his inauguration crowds, despite ample evidence disproving their claims—were surprising and alarming to many who were unaccustomed to seeing that degree of blatant dishonesty from the office of the President of the United States. On Saturday, during a visit to the CIA, Trump insisted, "It looked honestly like a million and a half people, whatever it was, it went all the way back to the Washington Monument." (It didn't). A few hours later Spicer attacked the media for its reporting on the crowd size. "This was the largest audience to ever witness an inauguration, period," Spicer said, which contradicted aerial photos, Nielsen ratings and D.C. Metro transit ridership. While networks try to spin the ratings in their favor on a daily basis, Trump's take on his show's performance went beyond stretching the truth. Often, Trump himself would call TV writers to spin the ratings "in a way which, to be blunt, was detached from reality," Vulture's Josef Adalian wrote last year. Other times, he'd dispatch Trump Organization staffers to demand retractions from those who printed—accurately—that Celebrity Apprentice's ratings were lower than earlier seasons of the show. "The worst part is that she kept asking me several more times if I would change my mind. She couldn't take a no," Uproxx TV critic Alan Sepinwall noted last year. But when it comes to Trump lying about Celebrity Apprentice ratings, TV reporters most vividly recall his last stand on the subject: almost exactly two years ago, during his final appearance on behalf of the show at the Television Critics Association's winter press tour. During that surreal press tour session, Trump claimed the show's nearly two-year hiatus wasn't because NBC was nervous about airing the show, but because "I was very busy for the last year and a half … I just wasn't able to do it." (Contestant Ian Ziering admitted later in the panel that the show had completed filming in April 2014, nine months earlier.) 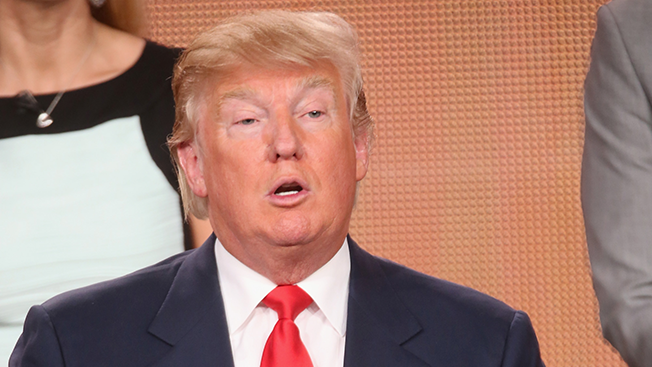 But Trump saved the biggest whoppers for discussing Celebrity Apprentice's ratings, proclaiming that it was "the No. 1 show on television." In fact, the show tied for 41st place that season in the adults 18-49 demo, and placed 67th in total viewers. When pressed on his erroneous claim, Trump replied that his show had beaten time slot competitor The Bachelor in the 18-49 demo. (In fact, Celebrity Apprentice often finished fourth in that time slot, behind The Bachelor, CBS' 2 Broke Girls and Mike & Molly, and Fox's Gotham.) He then claimed that if the second hour of Celebrity Apprentice was counted as its own program, instead of as a two-hour telecast, "it would be, in the 18-49, No. 1." It was another lie, and reporters weren't having it. Daniel Fienberg, now a TV critic for The Hollywood Reporter, said, "Mr. Trump, if the producers of Mike & Molly were to say that they had better 18-49 ratings than the Celebrity Apprentice the past two weeks, would they be wrong?" Trump was caught,. But even then, he refused to admit defeat. His voice lost a few layers of bravado, but his words were as defiant as ever: "That's what I had heard. That's what I was told." 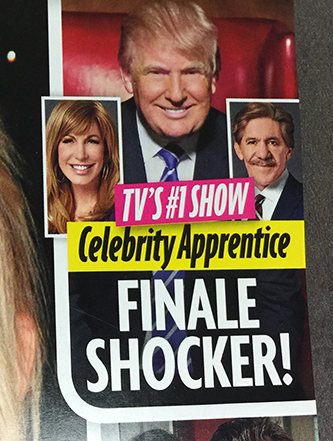 While most of the journalists at the press tour dismissed his ratings claims, a few weeks after that panel, the cover of the supermarket tabloid Star teased a story about the Celebrity Apprentice's season finale with the line: "TV's #1 Show." Once again, Trump pulled it off: by repeating the lie enough times, he managed to convince at least one outlet to print it, thus giving it traction and new life. The same pattern unfolded this past weekend, as several outlets debunked his and Spicer's claims, but others ran headlines with Spicer's "largest audience" quote. As Trump himself said during that panel, "That's the way I am. Whether people like it or don't like it, I'm not changing." And whether he's sending Lorenzo Lamas packing on Celebrity Apprentice or serving as the leader of the free world, he's not going to let little things like facts get in his way.